Compare to Cortaid or Cortizone - Hydrocortisone Cream is used to Relieve Minor Skin Irritations and is available in various boxes and trays. Treats skin irritation, allergic reactions, and other types of skin problems. Belongs to a class of drugs called corticosteroids. 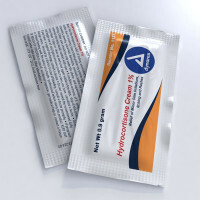 Hydrocortisone topical is used to help relieve redness, itching, swelling, or other discomfort caused by skin conditions. This medicine is a corticosteroid (cortisone-like medicine or steroid). 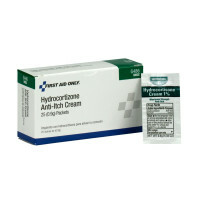 Hydrocortisone Cream - For topical application in treating a variety of skin irritations. Individual packets. Consult a doctor if you have a medical concern. Treats skin irritation, allergic reactions, and other types of skin problems. Belongs to a class of drugs called corticosteroids. If you are pregnant or breastfeeding, talk to your doctor before using hydrocortisone. Make sure your doctor knows if you have glaucoma, tuberculosis, diabetes, chickenpox, or a skin infection. Your doctor or pharmacist will tell you how much to use and how often. This medicine comes with patient instructions. Read and follow these instructions carefully. Ask your doctor or pharmacist if you have any questions. Use only on the skin. You should not use this medicine in or around your eyes. You should not use this medicine on your face or neck unless your doctor told you to do so. Apply a thin layer to the affected area. Rub in gently. Shake the lotion well before using. Do not cover the treated skin with a bandage unless your doctor tells you to do so. If this medicine is used on the diaper area of a child, avoid using tight-fitting diapers or plastic pants. Put on the missed dose as soon as possible. Skip the missed dose if it is almost time for your next regular dose. You should not use two doses at the same time. Store at room temperature, away from heat, moisture, and direct light. Do not freeze. Keep all medicine out of the reach of children. Ask your doctor or pharmacist before using any other medicine, including over-the-counter medicines, vitamins, and herbal products. Do not mix with or use other skin medicines with this medicine unless your doctor tells you to do so. 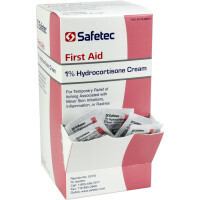 You should not use this medicine if you have had an allergic reaction to hydrocortisone or any other related medicine.